Mira Costa’s girls tennis team reached has turned in a performance this season that the Mustangs have not seen in more than 40 years. Coach Joe Ciasulli’s squad will vie for the CIF-Southern Section Division 1 championship Friday when Mira Costa takes on Dana Hills Friday at 10:30 a.m. at The Claremont Club. A victory in the finals would be the first since Mira Costa won back-to-back 3A titles in 1975-76. The playoff road had not come easy as the Mustangs edged Westlake in the semifinals on Wednesday. With the match tied 9-9, Mira Costa pulled out the victory on games won 83-76. The power of Mira Costa’s doubles teams was vital in the win with Lindsay Giese-Peyton Douglas, Olga Nagy-Kacey Feng and Hailey Huynh-Sydney Vo winning two sets each. Helping the Mustangs to victory were Nagy and Feng’s 6-1, 6-0 victories. In singles action, Audrey Vo won two sets and Nicole Wuelfing captured one. 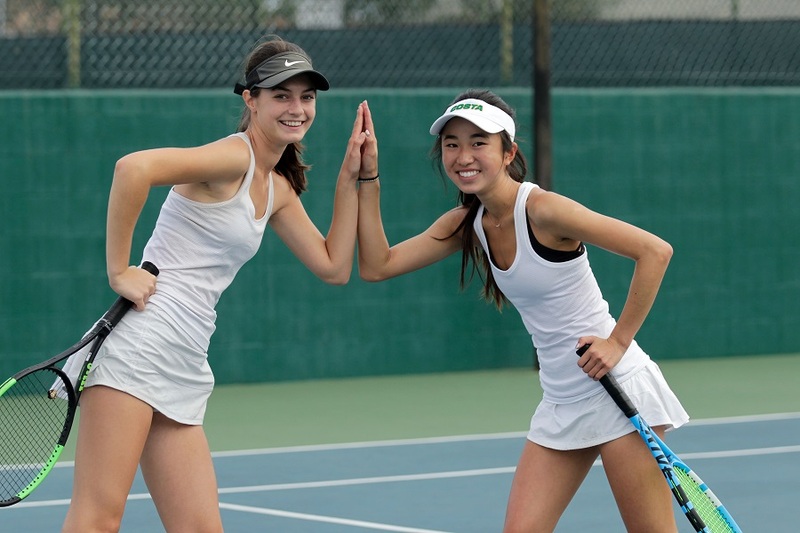 Olga Nagy/Audrey Vo were Bay League Doubles finalists, advancing to the Round of 16 of the CIF Individual Tennis Championships on Monday, Nov. 19, the furthest any Mira Costa Girls’ doubles team has ever advanced. In Division 4, Bishop Montgomery had little trouble defeating Temescal Canyon 12-6 with sweeps by Mya Pitts in the singles matches and Cameron Banks/Samara Guillory in doubles action. Bishop Montgomery will play El Toro for the championship at 1:15 p.m. Friday at The Claremont Club.